South Africa’s ANC (African National Congress) has won a commanding victory in the country’s general election, partial results show. With about 80% of the results in, the ANC has 63% of the vote, followed by the Democratic Alliance (DA) on 22%. The Economic Freedom Fighters (EFF) party is in third place with 5%. The electoral commission said voting passed off peacefully in most areas, with turnout at just over 72%. The elections are the first since the death in December of Nelson Mandela – the country’s first black president – and mark 20 years since the end of white-minority rule. Dissatisfaction with the government has been growing over high levels of unemployment, a lack of basic services and allegations of widespread corruption. The ANC is likely to use its impressive mandate to try to drive through its National Development Plan – rejecting nationalization, and emphasizing investment and infrastructure. The business-friendly plan has alarmed South Africa’s powerful unions – some of which may soon break away to form their own party, he says. He adds that, on 5%, the EFF are no threat to the ANC but their aggressive populism will keep ministers on their toes, and South African politics more abrasive than ever. The DA has increased its share of the vote from 17% in the last election to 22%, according to the latest results. Early on Thursday, DA leader Helen Zille told AFP news agency that she expected her party’s final vote to be around the 23% margin. “We’ll see how it goes. Of course, we hope it will be more. We did as much as we could,” she is quoted as saying. The DA has been trying to make inroads into the black electorate – its support is mainly concentrated in the Western Cape which has a large white and mixed-race population. Those born after the end of apartheid in 1994 were able to cast their ballots for the first time, although only a third of those entitled to do so had registered to vote. 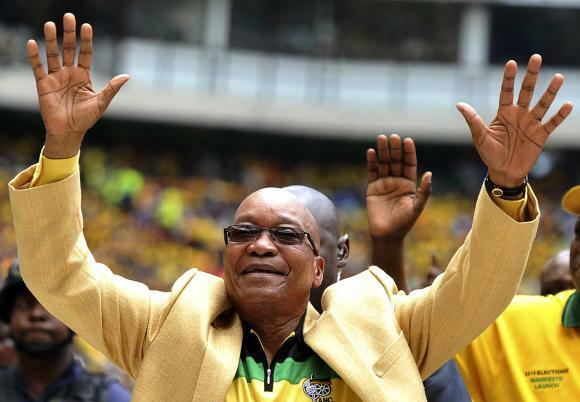 The ANC victory would return President Jacob Zuma for a second five-year term. He was dogged by allegations of corruption in the build-up to the election after an independent inquiry found he had “unduly benefited” from an expensive government-funded upgrade to his private residence. Speaking as he cast his vote on Wednesday, Jacob Zuma said he thought “the results will be very good”, but added that the campaign had been “very challenging”.